Bora Bora proudly wears the title ‘paradise on Earth’. This magical island lies in the South Pacific, northwest of Tahiti and has one of the most beautiful beaches and lagoons in the world. However, they only scratch the surface of the question ‘what to do in Bora Bora?’ There are numerous activities and exciting things to witness there, so let’s explore them together. 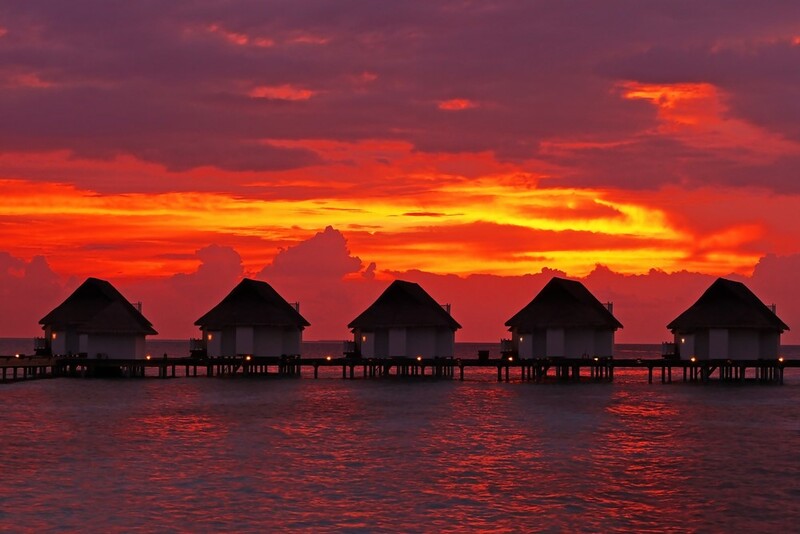 You simply don’t get bored on Bora Bora. Ever. The island offers unimaginable activities to keep you busy during the whole day, every season of the year. You can snorkel and meet the sharks in the breathtaking green lagoons with a tour like this. While you’re still in the water, you have the chance to stretch your muscles in a swimming excursion or take a boat and go fishing for unique species. If that isn’t enough, Bora Bora offers the best parasail tours that supply you with the needed equipment. You should only worry about having a great portion of fun in the air. 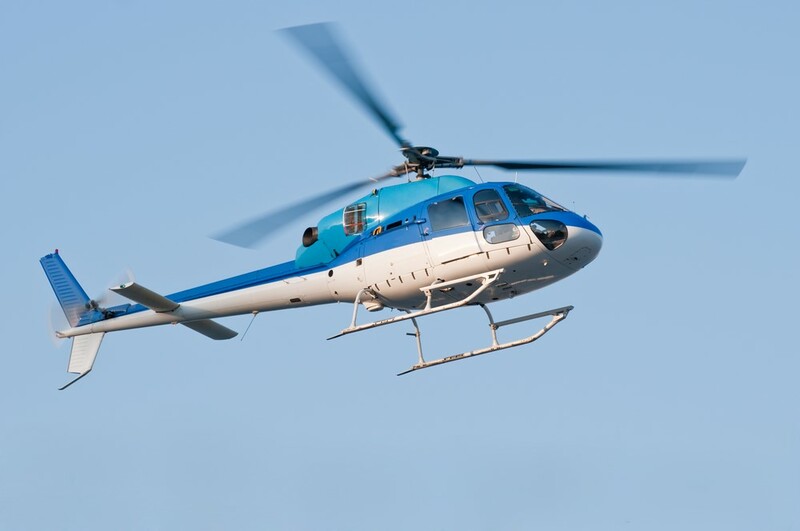 Speaking of the air, a must to experience are the helicopter tours over the island. With them, you’ll see an exciting view of the whole place and never regret even a coin spent. And when we add the jet skiing tours and the paddle boards, the adventure over the water is absolutely complete. There is nothing more thrilling than floating above the waves with the crystal clear waters and soft breeze all around you. 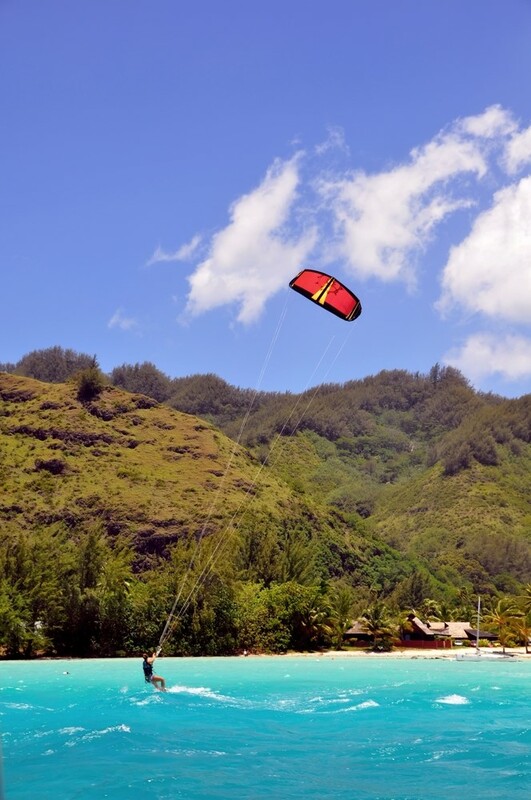 To accompany these, you can embark on a jeep safari, go kitesurfing, as well as taste the delicious Tahitian meals. Whatever you choose, you’ll surely have a blast. As for the attractions that this jewel possesses, I must say that they are as interesting and original as their names. Matira Beach, to start with, is the only public beach. With its soft sand and thrilling surroundings, it is a place you mustn’t overlook. Then, the Mount Otemanu, which is amazing all on its own. As the highest point on the island, it offers multiple tours and possibilities to explore a wonderful view of the whole Bora Bora. Speaking of the view, the most photographed islet, Motu Tapu, is another attraction that steals the hearts of all visitors. It is private, small and exclusively available to the adventure-seekers and romantic souls. 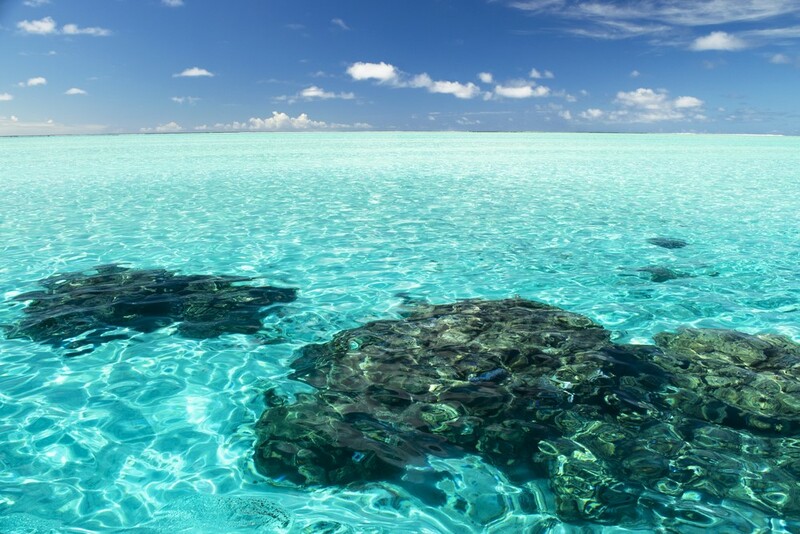 However, the whole picture of Bora Bora is not complete without the lagoon wonders known as coral gardens. That is why they deserve their place among the attractions that are definitely worth visiting. Among their ranks, we’ll add the village – Anau, the only town on Bora Bora – Vaitape, as well as its magnificent church. Not only that these places will give you the peace you need, but they’ll also help you create memories that will last a lifetime. Whether it is the turquoise water, green nature, sandy beaches, the glamour and the luxury or just the uncommon architecture, visitors fall in love with them at first sight. Be one of them and check out Viator’s site for more information. Finally, we came to the part that you’ve been waiting for so eagerly. Here’s what to do in Bora Bora from the moment you step on its soil. Enjoy! 1. 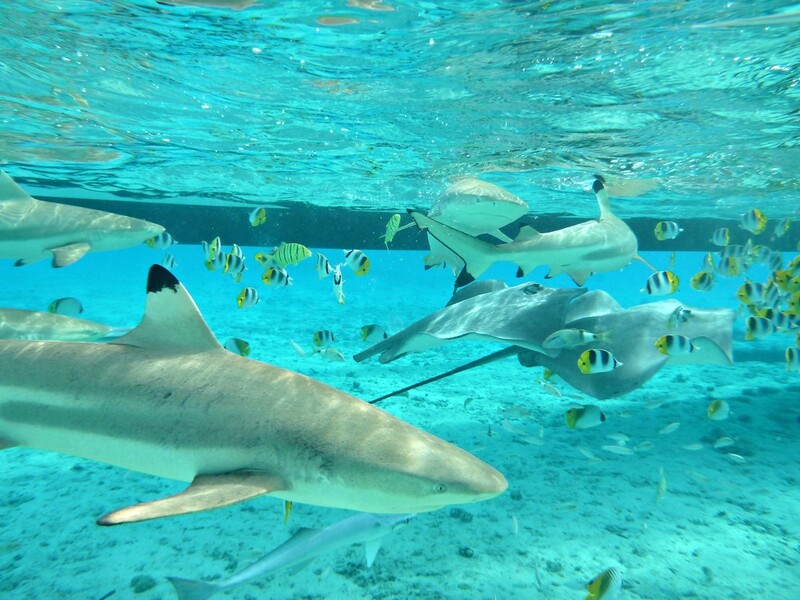 Shark and Ray Snorkel Safari – Put on your mask and dive into the clear waters of the green lagoons. 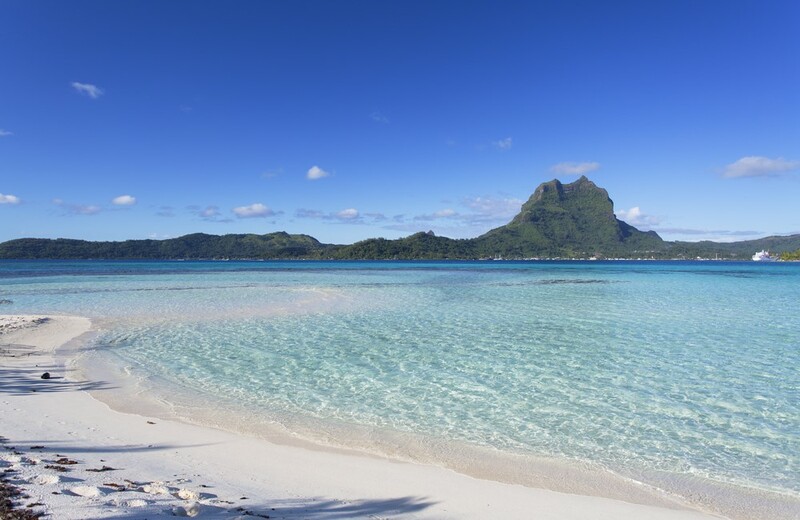 The public tours that you can take once you arrive on Bora Bora will help you with that. You’ll swim in 4 to 30 feet deep waters and admire the clarity they offer. But most importantly, you’ll get to meet different species of fish, sharks and rays. All that danger mixed with pleasure will make this an unforgettable experience. And the vividness of the colors down there is certainly mind-blowing. 2. 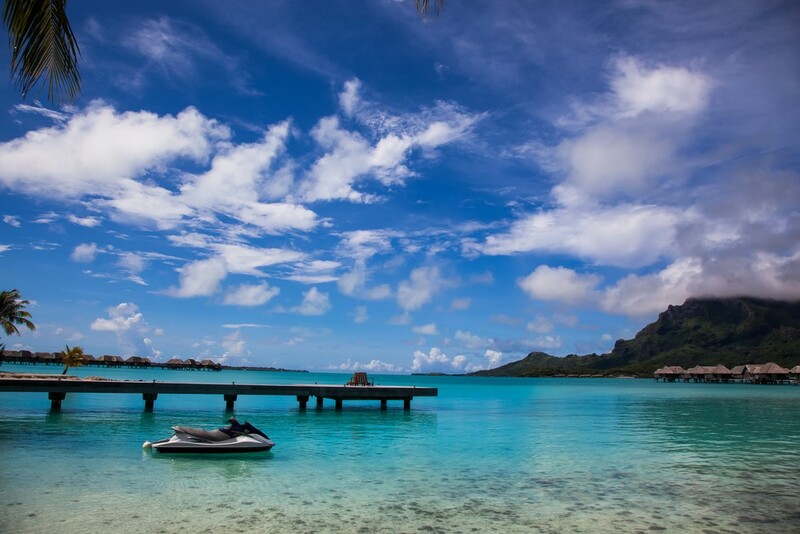 Jet Ski – What to do in Bora Bora has never been clearer. Jet skiing on the marvelous waves is the right thing to do for everyone desperate for the kick of adrenaline. These tours are guided by a professional and last approximately 2 hours. That means that you’ll get the chance to experience the spectacular sights of the sandy beaches, the bungalows as well as the motus around at a high speed. Leave the sharks shaking beneath you as you drive across the lagoon with the breeze on your face. 3. 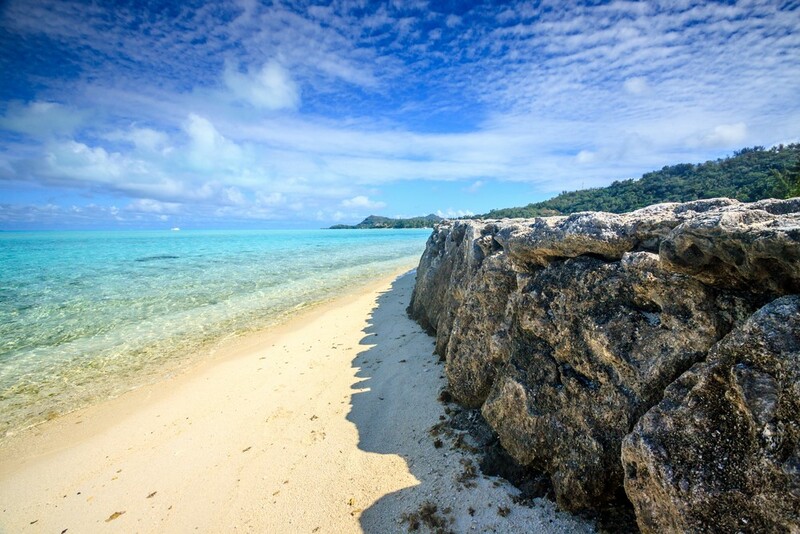 Motu Tapu – This private islet is just for the ones seeking utmost security and exclusivity. It is a small motu available only to the guests at the Hilton Bora Bora Nui Resort and Spa Hotel as well as invited guests. What’s interesting is that the hotel’s staff puts tables in the water, so that the visitors can taste a Tahitian meal. They also teach unique skills such as tying a wraparound skirt and opening a coconut. If that’s not enough, Motu Tapu is rich with white sands, wonderful reef for snorkeling and diving and chances for kayaking. 4. 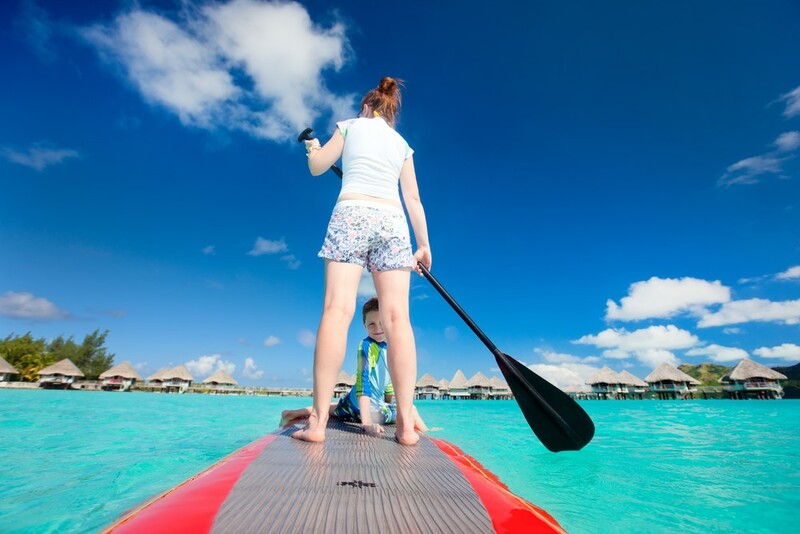 Paddle Board – Take a tour and learn the basic lessons of paddling to be able to meet Bora Bora in a whole different light. Your instructor will bring you to the best places around the island depending on your level of skill. Calm water spots for beginners and for the more advanced levels – downwind paddling. Once you get this down, you’ll freely wave the paddles in the clear waters and have the best time like a real pro. The experience is approximately an hour and a half long, but it’s enough to last a lifetime. 5. 4X4 Cultural Island Tour – Did you know that the American cannons from World War II are situated in Bora Bora? That and many more secrets are left to be uncovered with this tour. You go around the island with a professional guide who will show you an ancient temple (marae), tell you about the island’s legends and finally take you to a friendly meeting with a local family. Usually, they’ll serve you some fruit from the plantations, which is an authentic situation. For more information, take a peek at this site. 6. Kitesurfing – What’s the first thing that comes to your mind when we mention unimaginable kitesurfing adventure on Bora Bora’s gorgeous lagoon? That you have to try it! There’re no doubts that this experience is totally safe. You’re well-equipped with everything you need by the tour organizers, leaving you to cherish the fun this sport brings. You can take the tour from May through December when the weather is bright and it lasts no more than an hour and a half. Beginner or an expert – definitely try this out! 7. Swim at Matira Beach – This beach is open for everyone, making it the most popular public beach on the island. Stretching from hotel Bora Bora to Matira Point, it is one of the main things on the list of what to do in Bora Bora. It is surrounded by natural beauties, offering a deep shade from the palm trees and a pleasant atmosphere for all visitors. Without any worries, everyone can embark on a snorkeling and swimming spree all day long. This would also be a lovely place for the whole family as it has a flat surface and no big rocks. 8. 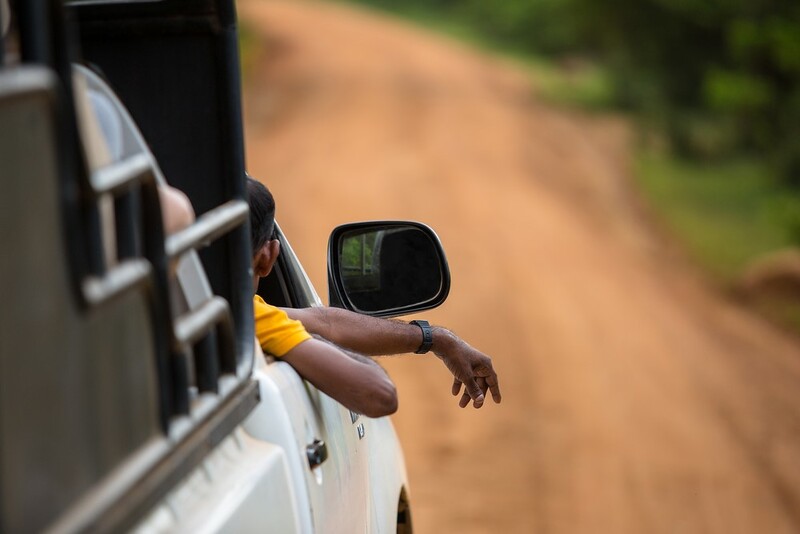 Jeep safari – With the leaves of the trees ruffling around you, enjoy the drive around the island. You’ll be taken to the most compelling spots with an equipped jeep and a crew that will show you everything there is to be seen. Not only Bora Bora’s history, but you’ll get acquainted with never-before-seen flora and fauna and mesmerizing way of life the locals lead. The jeep can access the most remote places that cannot be reached on foot, maximizing the excitement of it all. 9. 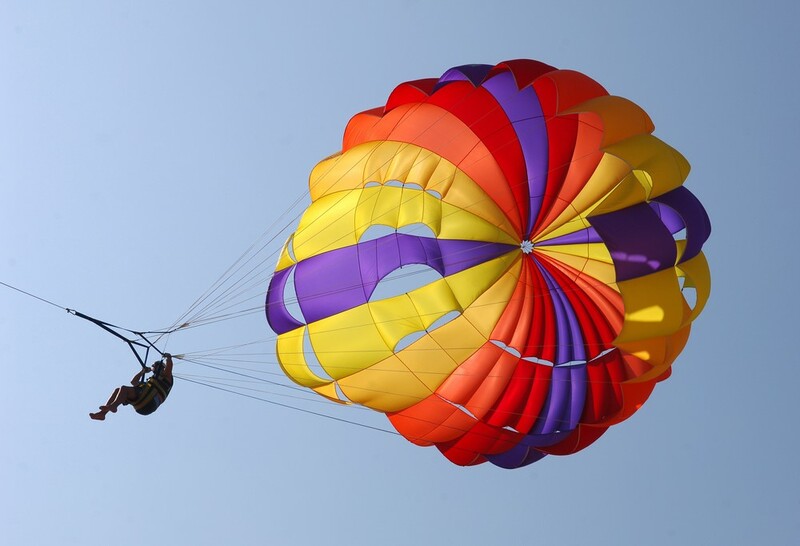 Parasailing – Launch yourself in the skies in your very own colorful parachute and set off on an unforgettable adventure. Your eyes will pop up in surprise at the sight of the small turtles and sharks below the water as well as Mount Otemanu around you. This tour operates every day except Sunday and includes transportation and duo or solo experience for 15 minutes. When you’re up there with the green lagoon at your feet, you realize that the world is so incredibly beautiful. 10. 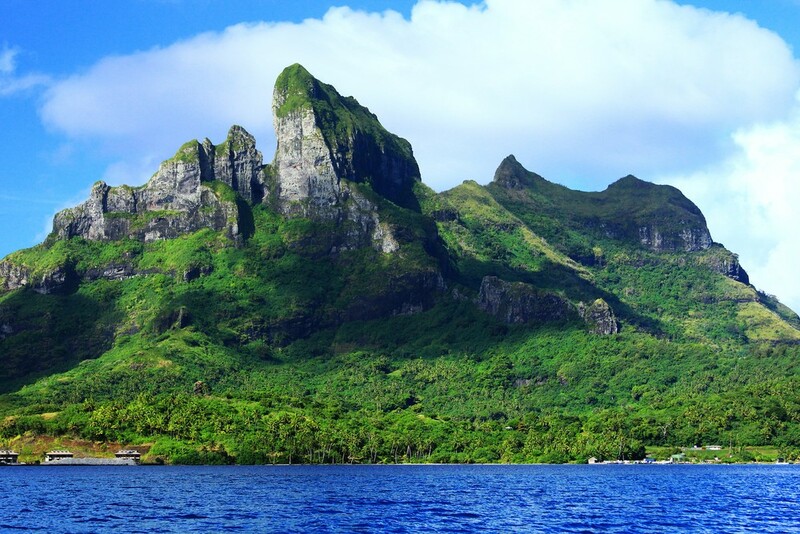 Lagoon tour – If you want to see a blend of everything that makes Bora Bora so special, you must try the lagoon tour. You climb a wooden canoe and taken around the island. Thanks to the guides with long experience and first aid certificates, you can enjoy the natural beauties of the island without worrying about anything. What is more, they’ll tell you everything you need to know about Bora Bora’s history and culture making this an unforgettable adventure. Also, the tour usually includes snorkelling and swimming in a coral garden where you’ll meet the sharks and rays. It’s a win-win situation. 11. Snorkel in the Coral Gardens – The list of what to do in Bora Bora is simply not complete without this amazing activity. Located just east of the main island, you’ll find a marvellous coral reef waiting to be explored. All you need is your snorkelling goggles and your curiosity to get the most out of the corals’ beauty. As the Coral Gardens have become a very famous attraction, a lot of visitors come especially for the colorful and unique fish and sea life, which is absolutely visible among the clear waters. In case you’ve already decided not to miss this out, mind that you can arrive there by boat or after around 20 minutes of swimming. 12. 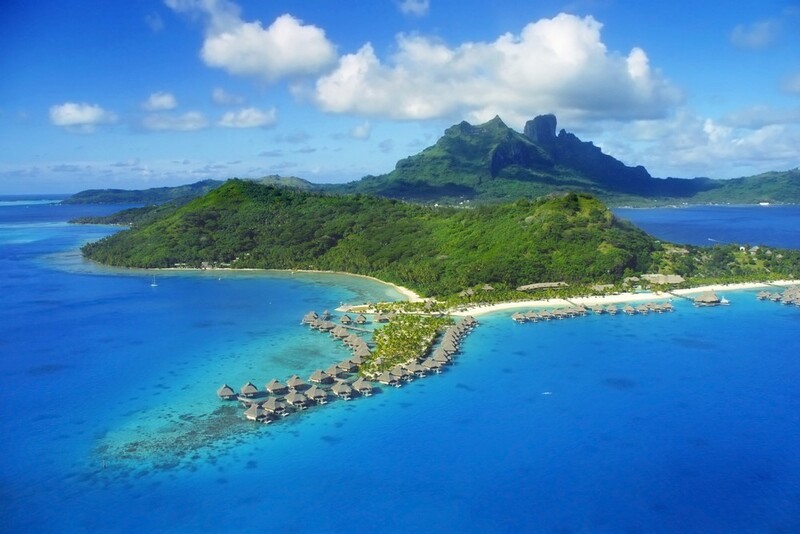 Helicopter tours – See Bora Bora in a whole new light and breathe in its fresh air from above the water. With the helicopter tours, you’ll set off on an unforgettable sightseeing experience. You’ll be able to get an aerial view of the magnificent turquoise lagoon, the tall Mount Otemanu as well as the bungalows that seem like dots from above. This tour operates every day if the weather is pleasant and lasts for 30 minutes, so you can take it at your convenient time. 13. 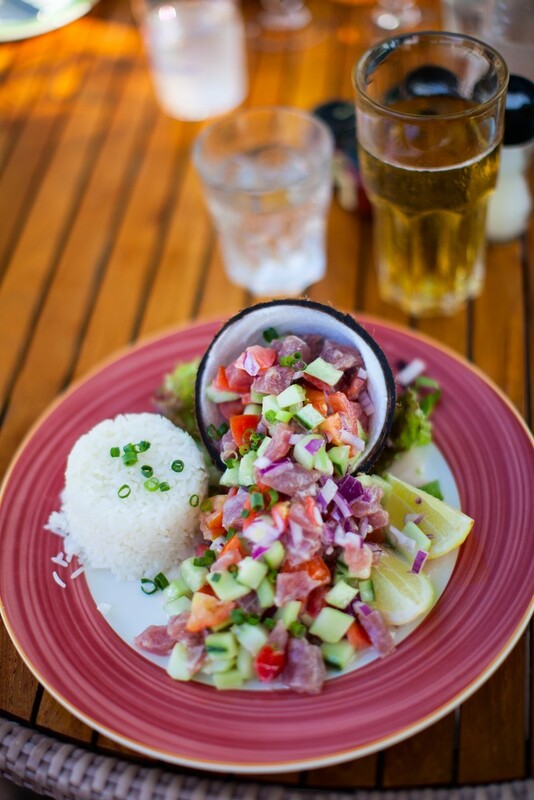 Taste traditional Tahitian meals – The simplest answer to the question – what to do in Bora Bora is, of course, eating. There isn’t a better way to completely understand the culture if you don’t try the traditional Tahitian meals. They usually consist of fish mingled with other ingredients such as lime or coconut that make the taste delicious and original. You can order this at your hotel or go to one of the restaurants on the main island and the exciting cafes located between Vaitape Village and Matira Beach. In any case, you’ll have a memorable time. 14. 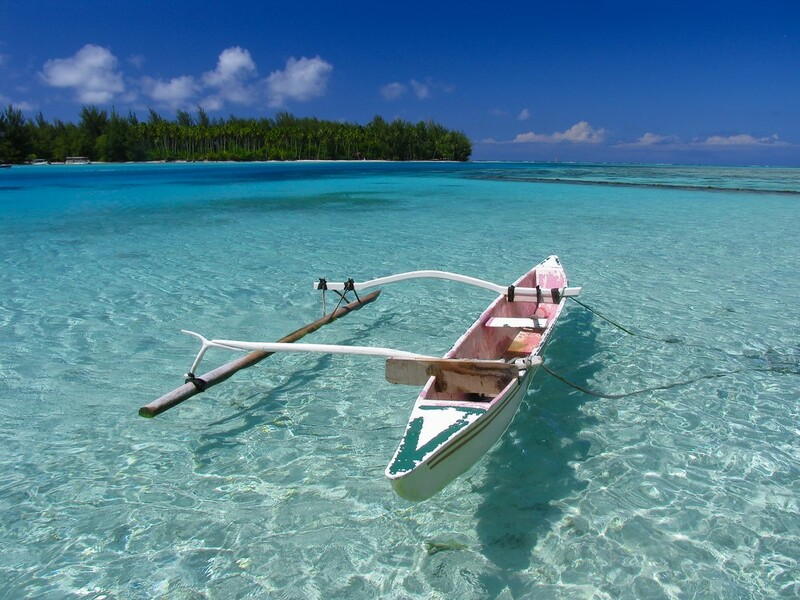 Fishing – Probably the most common sport in Bora Bora is precisely fishing. Climb a cool boat and prepare yourself to be fascinated by the gorgeous fish and underwater wildlife. Some say that it is definitely more than sport, but a lifestyle on the island and they couldn’t be more right. The most exciting moment besides the fishing is meeting the local guides. They’ll present Bora Bora like you’ve never seen it before through their fantastic experiences and endless knowledge of the sea. 15. 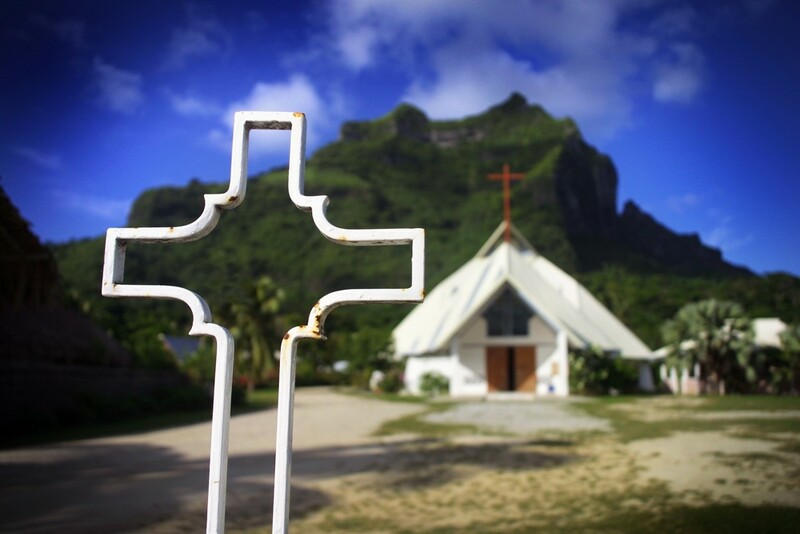 Paroisse Saint Pierre-Celestin Church in Vaitape – Bora Bora is famous for the glamour and the noise. However, there is something for those in need of a bit of peace and tranquility, too. The church Paroisse Saint Pierre-Celestin is a real gem on the what to do in Bora Bora list mainly because of its Sunday and holiday masses. A wonderful choir is singing native and French songs while all men and women are dressed in traditional clothes. Say your prayers and enjoy your privacy among the stained glass windows. For more information on the best time to visit Bora Bora and have the time of your life, check out this article.